An original Audrey composition, a small tribute. What is the medium here? The more I look at it, the more interesting it gets. Is this digital or organic? It's hard to tell in a pdf. There's a great story behind this, although it's best shared privately! As for the actual creation, it was all done in Adobe Illustrator. 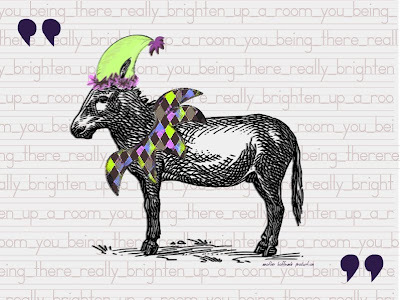 The vintage sketched vector donkey was a freebie. I took that and added the jester garb, which I drew myself with a stylus. The text is a great font, I believe called "SchoolHouse," or something of the sort, and included the old notebook lines. Added quotes are a different font, a common one although the name escapes me. I have hundreds of fonts and it gets bewildering. (Although Amen for Creative Commons sharing.) It's signed "Another Hoffmark Production," which is a throwback to what I used to write on stuff I made circa late 90s to early 00s. Had it on the shelf and decided to dust it off for irony's sake, in addition to not wanting to have my name placed directly below the donkey.